At this website the image <pic-clinton.jpg> shows the presidents of US, SK and CZ, and two quite large flags of the latter two states. On the photo, the Czech shade of blue seems to be noticeably darker than the Slovak one. Is this a mistake, a meaningless variation, an optical illusion, or is it supposed to be so? Historically, Antonio's source is not right. The blue triangle is a mere representation of the third Slavonic color (blue-red-white, beginning from 1848), and only secondarily it has been linked with blue colors from the Slovak *and Moravian* coats of arms. The blue triangle doesn't (and didn't) stand for Slovakia (or even for "Slovak mountains") explicitly, it is merely late mythology. Česká národní rada zákonem čís. 68/1990 Sb. z 13. března 1990 znak malý a znak velký, podle návrhů Jiřího Loudy - "Czech National Council adopted the greater and lesser arms with Law No 68/1990 on 13, March, 1990. Author of drawing: Jiri Louda"
using of Coat of Arms and flag. But which Coat of Arms and which flag? Which Law adopted the Coat of Arms and flag of Czechia in 1990 with descriptions? 3. Greater Coat of Arms - the same as the present greater Coat of Arms (quartered shield with two Bohemian lions, and Moravian and Silesian eagles). White over red bicolour with blue triangle at hoist reaching the center of the flag. Source: Album 2000. Here is some additional information on the Czech national flag, extracted from "Le drapeau tcheque - ceska vlajka" by Guillaume Narguet, Radio Prag, 2 April 2005. On 30 March 2005 the 85th anniversary of the adoption of the State arms (státní znaky) and the Czech flag (česká vlajka) was celebrated by the National Assembly of the Czechoslovak Republic. The author claims that the flag is sometimes used upside down and gives a few mnemotechnic tricks to remember that white should be on top of the flag: adults are told that froth on bier lays always on top, whereas children are told that when painting the flag the red paint would run down to the white part if placed on top. The 1918 Czechoslovak flag, horizontally divided white-red, was officially hoisted for the first time in Washington (USA) on 18 October 1918 on the house where lived Tomas Garrigue Masaryk (1850-1937; President of the Republic, 1918-1935). Source: http://www.radio.cz/fr/article/64995 - Link found by Pascal Vagnat. "1990-1992 flag" is NONSENSE. Czechia is the name which nobody uses. Here are two images confirming the use of the bicolour both as the flag of Czechoslovakia between 1918 and 1920 and Czechia within the Czech and Slovak Federal Republic. The first comes from the French magazine L'Illustration and was published in 1919. The illustration shows the flags of all the allies and among them a white-red bicolour for Czechoslovakia. 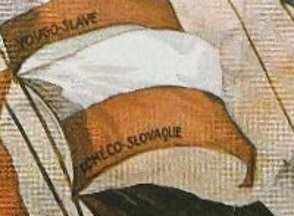 Source: Československá státní­ a vojenská symbolika (Czechoslovak state and military symbolism) by Zbyšek Svoboda. The second is a photo from the 1990 elections showing the Czech and Slovak arms and flag alongside the Czech arms and flag, the bicolour. According to the source the idea of separate Czech state symbols were considered in 1968 but were scrapped thanks to the Warsaw Pact invasion of Czechoslovakia and the ensuing normalization. The flag and arms were finally approved 01.03.1990. Source: http://vexilologie.kvalitne.cz/Symboly.htm - The photo is sourced to Michal Doležal of the Czech News Agency. Kryštof Huk, 7 Aug 2016.